Jacobinte Swargarajyam, the upcoming Nivin Pauly starrer directed by Vineeth Sreenivasan will be released on 8th April, 2016. The movie which was shot in Dubai has Renji Panicker, Reba Monica John, Sai Kumar, Sreenath Bhasi in the lead roles. Music of the movie is composed by Shaan Rahman and cinematography by Jomon T John. The film is distributed by LJ Films. 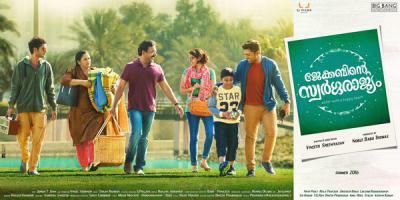 Jacobinte Swargarajyam is based on a real-life incident that occurred in director Vineeth’s friend’s family. Nivin Pauly essays Jerry, the eldest son of Jacob, which is performed by Renji Panicker.